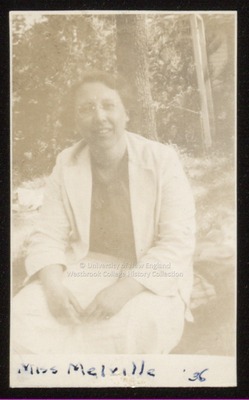 Elsbeth Melville sits on the ground in front of a grove of trees in this sepia toned candid snapshot with "Miss Melville '36" written on the front. She wears a light colored suit skirt and jacket with a dark colored blouse. Her hair is curly and wavy and comes just to her ears. She wears round frame-less glasses.